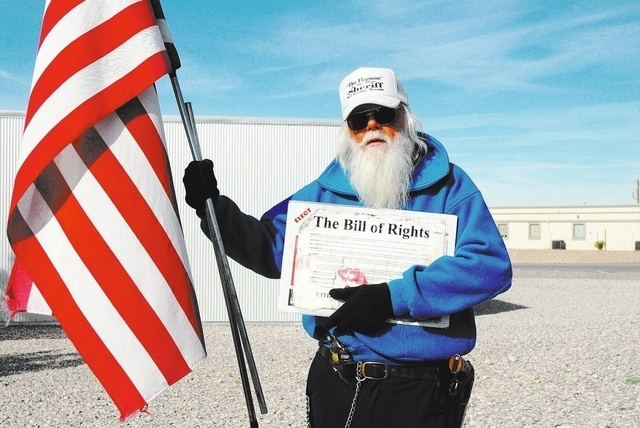 Nye County filed suit Jan. 2 against exotic animal Karl Mitchell and property owner Ray “The Flagman” Mielzynski, asking for the immediate removal of the animals from the Flagman’s 20-acre parcel at 6061 N. Woodchips Rd. The county is also asking the courts for an injunction to prevent them from having animals on the property without a conditional use permit. Nye County commissioners had already authorized the lawsuit. Mitchell owns Big Cat Encounters, which includes several tigers. The suit charges that Mitchell and Mielzynski permitted and harbored special conditions animals on the property without a conditional use permit like that required under a June 2007 zoning ordinance for housing special conditions animals in a rural homestead district. The dispute between Mitchell and Nye County over his current location dates back a year and a half. In June 2012, the Pahrump Regional Planning Commission deadlocked 3-3 over whether to grant Mitchell a conditional use permit; when they re-voted in August 2012, they voted 4-1 against issuing a CUP. 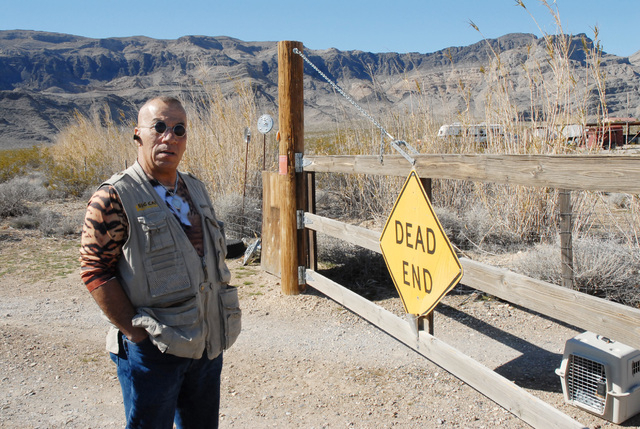 In October 2012, Nye County commissioners overturned the RPC decision and approved the permit. In February 2013, the RPC revoked Mitchell’s conditional use permit on the grounds he was improperly exhibiting animals in violation of his U.S. Department of Agriculture permit. The approval for the CUP requires compliance with all state and federal laws. This time, the Nye County Commission in April 2013 upheld the RPC revocation by a 3-2 vote. Mielzynski was served with a cease and desist order by Nye County code compliance in June 2013, ordering Mitchell to move his tigers off the property. “Defendants, and each of them, have deliberately ignored requirements permitting for the housing of animals designated as special conditions animals after having been informed of the requirements to obtain a conditional use permit as required by Nye County code,” the county suit states. Nye County states it is entitled to an order instructing the defendants to remove the special conditions animals from the property. After receiving the cease and desist order last June, Mielzynski said at the time the order wasn’t legally valid, since it was signed by county code compliance and not by a judge. The suit refers to the legal precedence of Mitchell continuing to flaunt the law. “Continued violation of the Nye County code is unlawful and interferes with the power and authority of Nye County to regulate the long range financial impact of the application of particular land to particular kinds of development, to preserve the relative suitability of the land for appropriate development, to ensure the protection of existing neighborhoods and communities and to promote the health and the general welfare of all residents of Nye County,” the suit states. Mielzynski, who has been a perennial candidate for Nye County sheriff, couldn’t be reached for comment by press time. When asked for comment Wednesday, Mitchell said he was confident he would prevail in court. In the meantime, he continues to house his animals on the property, which includes 11 big cats. Mitchell said he can claim a hardship, a waiver to a conditional use permit. He added other exotic animal owners don’t have conditional use permits, which is discriminating against him. Mitchell also claimed Big Cat Encounters is an animal shelter authorized under Nevada Revised Statute 574, which are exempt from the code. Another point that could come up in court is the planned reduction in the Pahrump Regional Planning District, scheduled for a public hearing Feb. 18 by county commissioners Tuesday. Mitchell said the Flagman’s property would no longer be in the Pahrump Regional Planning District if the bill is approved, which reduces the size of the planning district 38 percent from 373 square miles to 231 square miles, removing Johnnie and parts of the far northwest side of Pahrump Valley. He said that would mean a CUP wouldn’t be required for the property, located in a remote part of far northern Pahrump.